A date for your diary: “Féria de Pentecôte in Nîmes – May 23-28, 2012. Don’t miss out on the Feria de Pentecôte or Pentecost Feria in Nîmes this spring! Held for the first time in 1952, the five-day festival runs from Thursday to Whit Monday. It’s one of the most popular events in Europe, drawing crowds of over a million bullfighting enthusiasts and merrymakers. Nimes Pentecost Feria begins with Pegoulade, a huge carnival parade that winds its way through the city streets and culminates in a large firework display in the arenas, launching the mass celebrations. 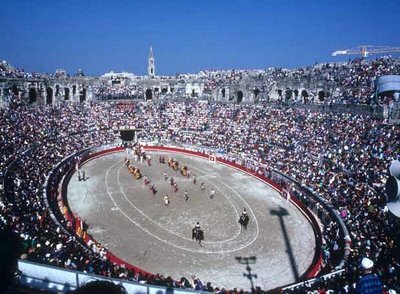 The world’s best toreros demonstrate their skills in corridas in the ancient Roman amphitheatre before the streets fill with revellers enjoying the open-air concerts and dance parties that go on throughout the night. As this is the south of France, there is of course a wonderful variety of local specialities to eat and drink whilst soaking up the electric atmosphere across the city. This entry was posted in Nimes. Bookmark the permalink.